I just recently updated my VMware Workstation software on my UBER-Workstation to 7.1.2 build-301548. The next time I fired up my lab I noticed I was unable to connect to any of my VM’s via my workstation. After making sure firewalls, listeners, and all other possible culprits were not the issue; I finally realized that something had happened with the Workstation upgrade. My workstation is running Windows 7 x64 and I had just recently patched it also. Well with a little mucking about I found the fix to my exact issue. I had been using local Host-only networks with a virtual adapter for my UBER-workstation added to allow connections to the VM’s on that network. Well evidently this was broken somehow. After a reboot, restarting VM’s, and all the simple steps I finally found the fix. 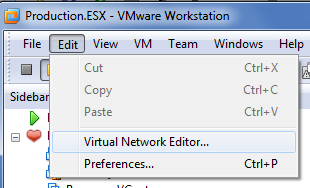 Go into your Virtual Network Editor (pic 1) and go to each host network you have created. 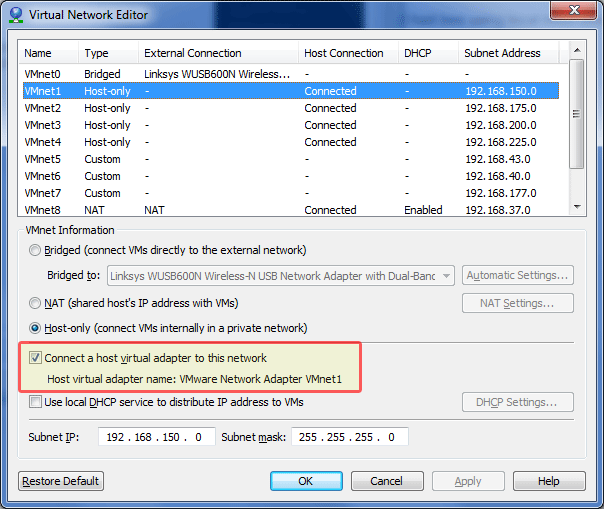 Uncheck the "Connect a host virtual adapter to this network" (pic 2) and click apply. Wait a couple seconds for the adapter to clear from Windows (you can watch the manage adapters page to be sure). Then recheck this same button and it will recreate the adapter. This fixed the issue for me immediately. I still had problems with certain Windows 2008 VM’s even after the above. I noticed that the VMware Tools on each VM needed an update with the new Workstation. I updated the tools and after the second reboot they started pinging as well.